In order to understand the jet stream you need to have some idea of what is occurring in the atmosphere nearest the ground; known as the troposphere. It is also helpful to understand the formation of Hadley, Ferrel and Polar cells and how The Coriolis Effect influences these tropospheric cells. The jet stream flows in both hemispheres around the earth, but for ease this article will consider the Northern Hemisphere only. The jet stream is a strong flowing ribbon of air that flows around our planet high up in the atmosphere, at around the level of the tropopause. Situated between the troposphere and the stratosphere, the Jet Stream is approximately 11 kilometres above the surface of the Earth at the poles and around 17 kilometres above the surface of the Earth at the equator. The jet stream flows at around 160kmph (100mph). We often hear that the jet stream is responsible for influencing the weather in the UK, so it is natural to wonder what causes the jet stream and why it has such an influence on the weather we experience on the ground. The boundary between the mid latitude air and tropical air . The Subtropical Jet. Both these jets are separate entities but they can join up from time to time across an area of the earth. The polar jet is the strongest as the temperature gradient across Polar and mid latitude regions is greatest. This is increased again in the Northern Hemisphere during winter. Both the subtropical jet and the polar jet travel from west to east and both would travel uniformly and evenly around the earth if it wasn.t for other influencing factors. See Fig 1. below for an example of a typical jet stream chart across the earth. 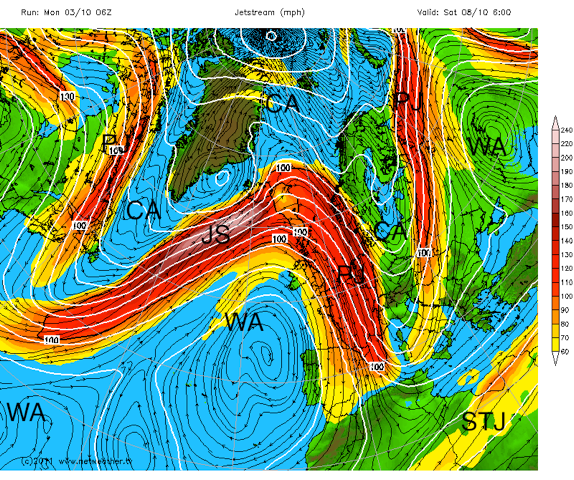 Fig 1: The jet stream is shown in red at its strongest point fading to yellow at its weakest. The STJ is the area where the subtropical jet is flowing, the PJ is an area where the polar jet flows and the P&STJ shows where the jet streams have combined. The factors that influence the flow of the jet stream are the landmasses and the Coriolis effect. Landmasses interrupt the flow of the jet stream through friction and temperature differences, whilst the spinning nature of the earth accentuates these changes. So the jet stream meanders across the earth, like a river meanders before it reaches the sea. The meandering sections of the jet stream continue to change as they interact with landmasses once again, creating an ever-changing state of flux and subsequent temperature differences. In winter the temperature of the stratosphere can also have an effect on the strength and position of the jet stream. The cooler the polar stratosphere, the stronger the polar/ tropical differential becomes; encouraging the jet stream to gain in strength. The warmth of the landmasses and oceans (such as the El Nino Southern Oscillation) can also have a bearing on the strength and amplitude of the jet stream. The strongest areas of the jet stream are known as jet streaks. These are areas where the jet stream has increased in speed by as much as 100kmph. A typical jet streak is 160km wide, 2-3 km thick and lasting several hundred km in length. The strongest jet streams are seen where the upper air temperature differentials are greatest, the weakest jet streams appear when the opposite is true. Strong jet streams tend to have very little meandering associated with them whereas weaker jet streams have a considerable amount of meandering associated with them. Jet streams are strong upper air currents circumnavigating the globe. There are two main jets: the polar jet and the subtropical jet. Jet streams can fluctuate in strength between 100-200mph. The jet stream meanders in waves. How does the jet stream affect the weather in the UK? To try explain how the jet stream affects the weather in the UK, it is worth going back to the jet stream chart seen in Fig 1, now zoom in to the jet stream analysis over the Atlantic as seen in Fig 2. The jet stream is shown in pink at its strongest point fading to yellow at its weakest. CA=cold polar air, WA=warmer air, PJ=polar jet, STJ=subtropical jet, JS=jet streak. From Fig 2. you can see that the polar front jet meanders across the country in a wave like pattern. These waves introduce pockets of colder air southwards and warmer northwards. 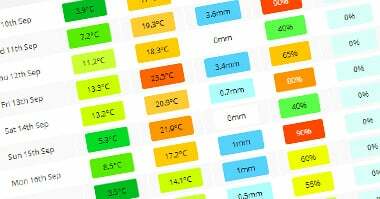 The temperature change is demonstrated by looking at the air temperature at a high enough altitude in the atmosphere, where ground and sea temperatures do not affect it .around 1500 metres in altitude where the air pressure is around 850 hPa. Fig 3. shows how these temperatures match the fluctuations in the jet stream. From looking at Fig 3 and the 850-hPA temperatures you can see the clear boundaries between the cold and warm air masses, which is being divided by the polar jet. You can also see the demarcation between warm and hot air that the sub tropical jet is demarcating. This demonstrates the pattern of the jet stream, showing how it is linked to and by the difference in warmer and cooler air masses. Furthermore, looking back at FIG 2, the wave pattern associated with the polar jet has distinct peaks (ridges) and troughs. It is no surprise to find that when we overlay the jet stream with a chart showing sea level pressure, that the ridges occur where sea level pressure is highest and the troughs occur where sea level pressure is lowest (as FIG 4 demonstrates). This is because air rises where troughs are situated and sinks where ridges are occur. Rising and sinking parcels of air will therefore determine the type of weather that a region experiences. R=ridge, T=trough, X=deep sea level depression or low. Look at the area X on Fig 4. which is situated towards the west of Iceland. This is a common cyclonic or baroclinic depression that is caused by the difference in pressure and temperature over a region. This is feeding strength to the jet stream, which is then invigorating the depression. The circled area is where the jet stream is strongest . the jet streak. The purple box marks the winds entering the jet streak. The winds leaving the jet streak are marked by the black box. The winds leaving the jet streak are rapidly diverging, creating a lower pressure at the upper level (tropopause) in the atmosphere. The air below rapidly replaces the upper outflowing winds. This in turn creates the low pressure at the surface (marked X on fig 4). This surface low pressure creates conditions where the surrounding surface winds rush inwards. The Coriolis effect creates the cyclonic rotation that is associated with depressions. The strongest surface winds in any developing depression are normally seen at the left exit point of the jet streak, where the jet streak is strongest. Fig 5: The black oval indicates a jet streak, the purple square indicates entry winds into the jet streak and black box indicates rapidly diverging exit winds. The positioning and strength of the jet stream determines where ridges and troughs are associated and this in turn influences the surface weather. During periods when the jet stream is flat and strong with little amplification or meandering, the UK is likely to experience weather that is driven straight in from the Atlantic. This is characterized by wet and windy weather with temperatures near to average. This condition is often termed .zonality. as the warm and cold air masses are clearly defined by a straight fast flowing jet. 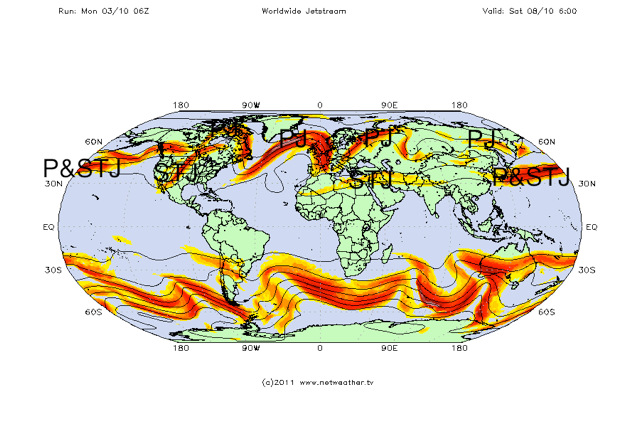 During periods when the jet stream is amplified (such as Fig2) the pattern will be different. This is often termed meridional with polar air travelling further south than usual and warmer sub tropical air travelling further north. The exact positioning of the amplification of the jet stream will determine whether or not the UK is in cold polar air or warmer air from lower latitudes. If a meridional pattern becomes stagnant then the UK may experience either of these conditions for a period of time and the pattern may be known as .blocked.. 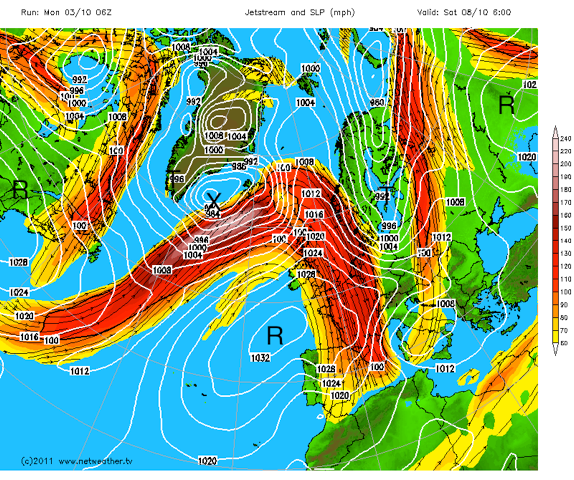 The position of the jet stream over the UK determines the type of weather we experience. If the polar front jet is situated significantly to the south of the UK we will experience colder than average weather. 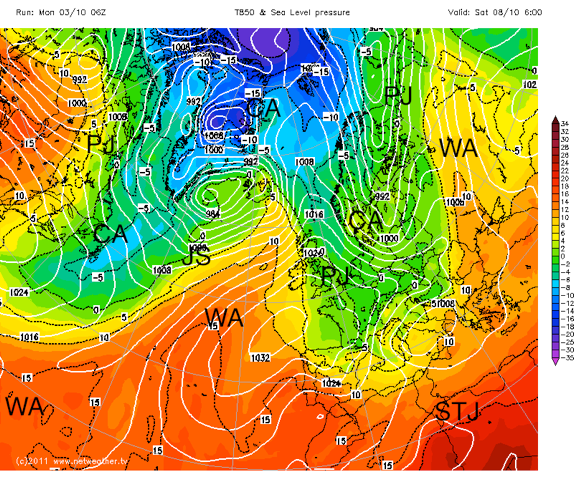 If the polar front jet is situated to the north of the UK we will experience warmer than average weather. If the polar front jet is situated over the UK we will experience wetter and windier than average weather. If the polar front jet has a large amplification then cold air will travel further south than average and warm air will travel further north than average. The direction and angle of the jet stream arriving at the UK will determine what source of air (i.e. cold, dry, warm, wet, from maritime or continental sources) the UK experiences.